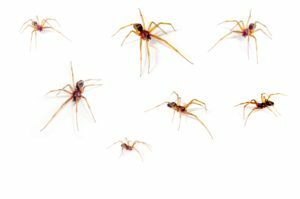 When it comes to having a spider infestation in your home, we know those creepy crawlers are the last thing you want to think about. These cringe-worthy creatures probably give you goosebumps just thinking about them. As small as they can be, some spider variations are extremely harmful. You should never have to lay in bed at night and wonder what is crawling beneath you. Whether you have harmless web-building spiders invading your home or the dreaded black widow, we strive to provide you the peace of mind that we will take care of the problem for you. Many spiders will never cause actual harm to your body, but with their tiny eight legs and sticky webs, no one wants to have them around. One spider is too many. Our exterminators make sure you never have to settle and live with them being around your home. When Eastland Pest Control services comes to your home, we will take our time diagnosing what type of spider is infesting your property. Different spiders require different extermination techniques, we will determine what type of spider it is and treat accordingly. We are committed to each one of our customers and aspire to be who you can count on at all times when it comes to getting the spiders out! We use family friendly solutions and tactics, you can rest assure that your family and pets will never be harmed during our extermination process. If you are tired of seeing spiders in your home, it’s time to do something about it today.